Few buildings are more recognized around the world than the Sydney Opera House; it is one of the most significant buildings of the twentieth century and a symbol of both Australia and its most populous city. On a yearly basis, it stages 2,500 performances, attracts more than 8.2 million visitors, contributes over $1 billion to Australia’s economy, and supports 12,000 jobs. What may be less well known about this architectural icon is that the drama of the building’s construction rivals some of the plots that have been presented on its stage. 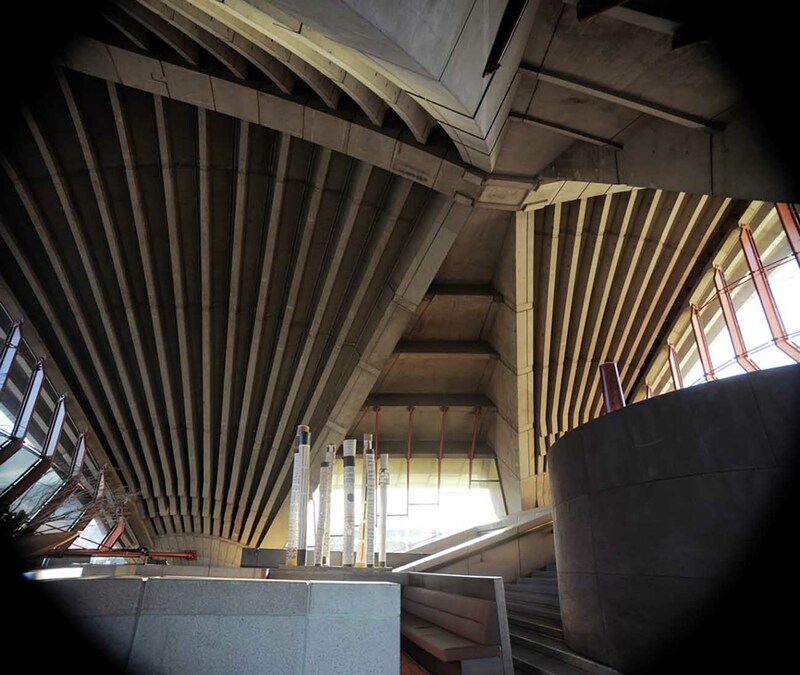 The building took 16 years to complete (from 1957 to 1973) and ended up costing about 15 times more than was initially proposed, leading to public outrage and the eventual resignation in 1966 of its architect, Jørn Utzon, from the project. Today the tensions behind the construction of the Sydney Opera are in the past, and the focus has now shifted to preserving its complex structures and materials for generations to come. A Keeping It Modern grant from the Getty Foundation is supporting the development of a conservation strategy targeted at the building’s concrete construction that will set the stage for its future. With a building of this stature comes a great responsibility to ensure its proper upkeep and smooth functioning. 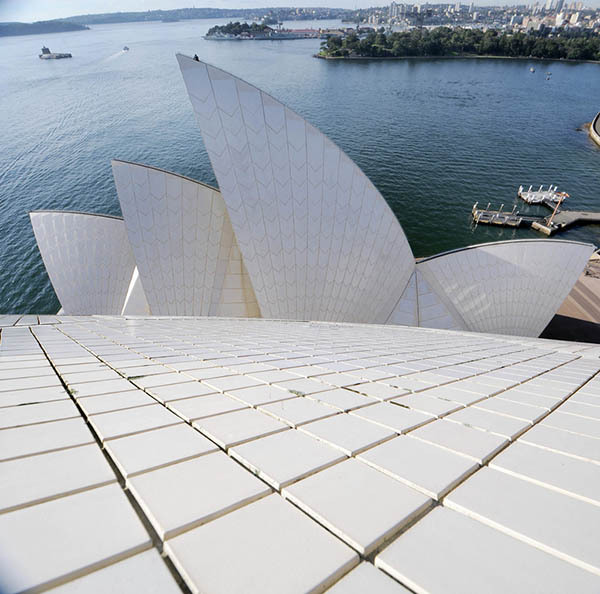 In addition to visitors, programming, and daily activities, the Sydney Opera House Trust, the nonprofit agency in charge of the site, manages the structure’s conservation management plan, which is an active document that is currently in its fourth iteration. Being aware of the need to consider the effects of weathering on the building from a marine environment and climate change, the Trust—with the Getty Foundation’s support—is engaged in a two-year project, Concrete Conservation, that involves working with a team of heritage experts and students from the University of Sydney to analyze the building’s concrete, test non-invasive conservation techniques, and develop a management system to monitor the condition and performance of the building now and into the future. We owe the existence of the Sydney Opera House—in no small part—to a moment of great optimism in the power of technology and industrial materials. 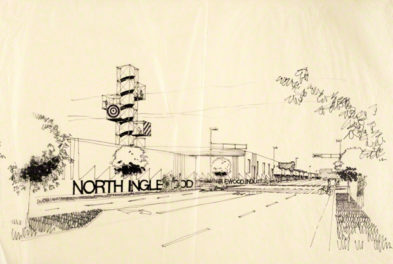 By the time the competition for its design was launched in 1955, a half a century of experimentation had paved the way for radically innovative architecture. 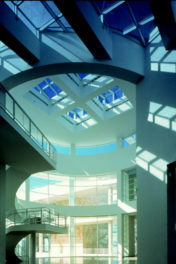 The structural capabilities and flexibility of concrete, in particular, rendered it a material of limitless possibilities. 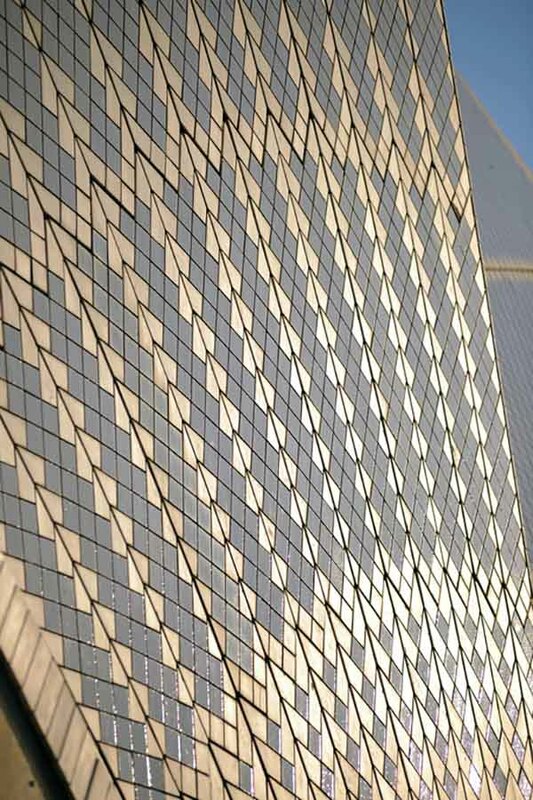 It is against this backdrop that Jørn Utzon (1918–2008) approached the design for the Opera House. Utzon’s design of “sails” jutting over each other was so striking and unique that, despite being a relatively young and unknown architect, his proposal was selected from over 200 entries. 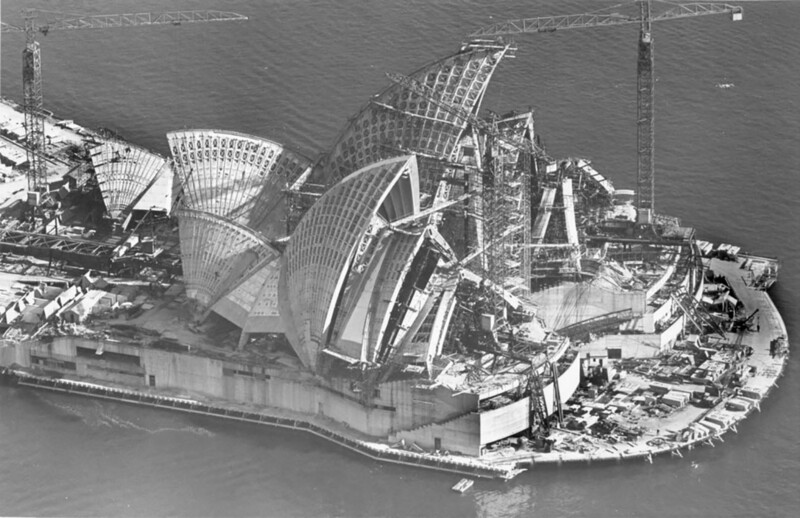 Once the selection of Utzon’s plan was announced in 1957, Ove Arup (1895–1988) was hired as the structural engineer for the project, and to him fell the daunting task of resolving the engineering requirements to build the Opera House. What followed can be considered one of the greatest experimental moments in the history of modern architecture. Building the sails was a challenge because they had to be broad enough to cover the expanse of the performance halls, and their weight needed to be properly distributed. Complicating the situation was the fact that each sail was a different size and tilted at a different angle. In his original design, Jørn Utzon envisioned a construction supported by pre-cast concrete ribs and a steel-reinforced concrete frame serving structural as well as aesthetic purposes. Casting each sail individually, however, presented an insurmountable expense, so an alternative technique had to be devised. Indeed, Utzon’s proposal would undergo numerous reiterations and modifications to make it structurally viable. Arup & Partners resorted to computing technology—one of the earliest uses in the history of architecture—to calculate the stress of the arches. After four years of problem solving, the solution concocted was to construct the sails based on the geometry of a single sphere. 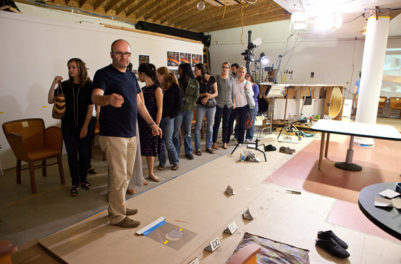 This spherical solution involved redesigning the sails so they would all share the same arch curvature, much like the sections of an orange; this would allow the same mold to be used for precasting multiple ribs and shells. With unprecedented design and construction come unprecedented conservation needs. 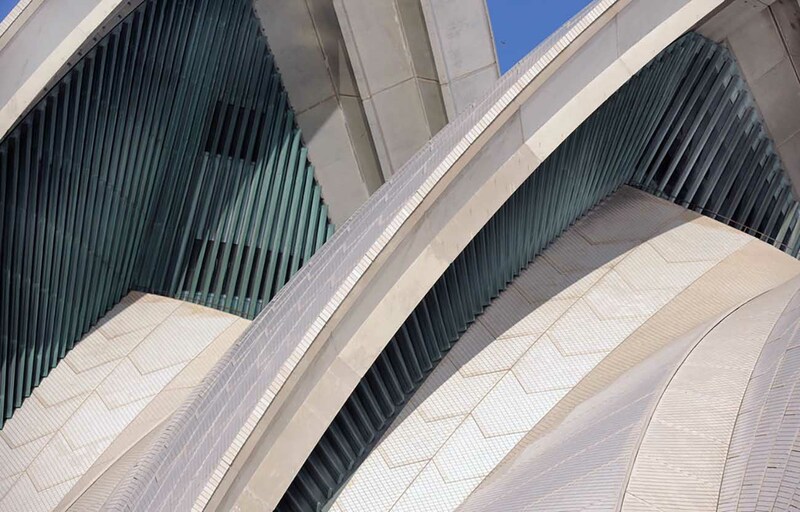 The sails of the Sydney Opera consist of a layer of concrete ribs and over one million chevron-shaped ceramic tiles that are carefully slotted within a metal structure that holds them in place. Accessing the roof tiles is a major ordeal: it requires impeccable planning and security, mobilizing large equipment to enter through the roofs of the concert halls, and working with precision so as not to disrupt the integrity of the building or the scheduling of events. Conservation work must not only maintain these elements in good condition, but also anticipate their future performance and deterioration. With a commitment to cultivating stewardship and expertise in younger generations, the Concrete Conservation team includes 12 students from the University of Sydney working alongside five faculty members undertaking original research in heritage conservation, engineering, and architecture. And Did We Mention the Robots? Focused on strategies that will have lasting effects, the team is gathering crucial data for monitoring change and determining causes of deterioration (including less studied materials such as binders and sealants), and testing intervention techniques that can happen with minimal human intervention. And they are even looking into using robots for conservation work in places that are hard to reach! The team’s data will be fed into a digital management tool that’s linked into a continuously updated geo-spatial 3-D model of the building and site to inform everything from routine maintenance work to specialized conservation treatment. This means that structural and scientific data, as well as management plans and critical information about heritage significance, are gathered into a single, easily accessible electronic repository that the Trust’s several thousand staff members can use to inform their daily work in ways that protect their cultural landmark. Furthermore, the system will enable the Trust to counter the unpredictable effects of climate change and thus continue its tradition of outstanding heritage management and conservation practice—paving the way for people around the world to continue enjoying the Opera House well into this century. I specialize in heritage strategies and am a former graduate intern who worked on preservation initiatives at the Getty Foundation. The first sentence in article, that is, “Few buildings are more recognized around the world than the Sydney Opera House; it is one of the most significant buildings of the twentieth century and a symbol of both Australia and its capital city,” — is incorrect. The capital city of Australia is Canberra, not Sydney. Thus, the Sydney Opera House can not be a symbol of the capital city [of Australia]. Yes, The Sydney Opera House is a symbol of Australia, as are the koala, and kangaroo. Thank you, Victor, for pointing out this error. We’ve corrected it in the text. Must politics intrude into everything?